Discussion in 'Nginx and PHP-FPM news & discussions' started by eva2000, Jun 4, 2014. The client makes a request to download a file. This request is received by NGINX and is passed to an upstream server containing the access control application. The upstream server checks to see if the user is logged in and has access to the resource being requested. If the user is not logged in or does not have access, then they are redirected to a login or access denied form. If the user is logged in and has access to the requested resource, then the internal URL of the resource will be set in the X-Accel-Redirect header. 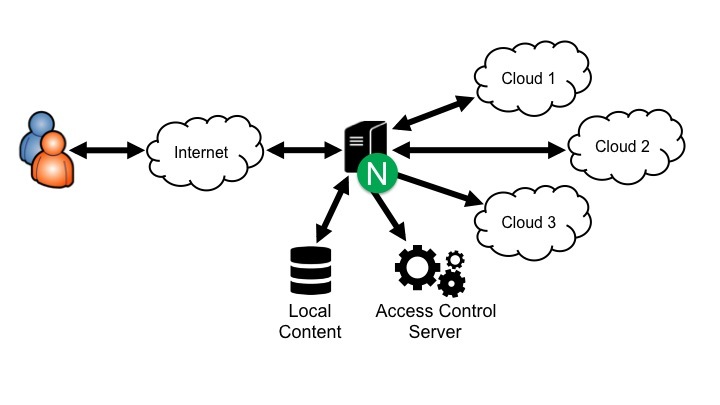 NGINX, using the URL from the X-Accel-Redirect header will do an internal redirect and serve the content, either locally or from a cloud server, discarding the actual response body returned by the access control server. This allows for a division of effort — NGINX performs the functions it is designed for, such as delivering static content and reverse proxy load balancing, and the application logic resides in the application freed from the details of delivering static content. This also allows for the URLs used by clients to be unrelated to the actual location of the resource. The content can therefore be moved from cloud to cloud without having to change the URLs used by clients or any reconfiguration of NGINX. The mapping of external URLs to the actual location of the resource is handled by the application. NGINX handles the redirect specified in the X-Accel-Header automatically, simplifying the NGINX configuration. # PHP will default Content-Type to text/html. Using this configuration, with the php program available at 127.0.0.1:8080, the file abc.jpg in the /var/www/files directory on the NGINX server and www.example.com mapped to the IP address of the NGINX server, if you were to enter “http://www.example.com /download/abc.jpg” you will see abc.jpg displayed in the browser and the URL will remain set to “http://www.example.com /download/abc.jpg” even though it was served at “/files/abc.jpg”. Using this configuration, if you enter “http://www.example.com /download/30-banner” you will see the NGINX AMI banner page displayed in the browser. The URL will remain set to “http://www.example.com/download/30-banner” even though it was served from Amazon S3. In a real world use case, there would be logic added to the PHP program to make a decision about how NGINX should response to the client’s request and additional headers may need to be set by NGINX and the PHP program and additional NGINX directives may need to be used, but these examples have been simplified to show just the basics of what is required. The post Build Hybrid or Multi-Cloud Applications with Access Controls appeared first on NGINX.